If you are reading this you have likely read it on another post as well. 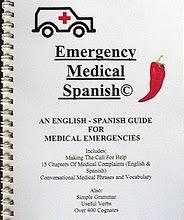 But for that small portion of readers who don’t read all the other blogs out there, here’s an interesting item that I read on my friend Debi’s blog regarding an Emergency Spanish dictionary where you can apparently find the words to express how you feel. This may sound romantic, but believe me, when you are doubled over in pain in a hospital with a 360 degree circle of Mexican nurses and doctors people asking you things the term ‘expressing how you feel’ takes on an entirely new meaning. Debi’s post on the subject is on her blog. Have a terrific Friday, everyone and enjoy the hot weather. Find a cenote, or a beach with few people. Actually, at this time of the year, stay home. It will be more peaceful.